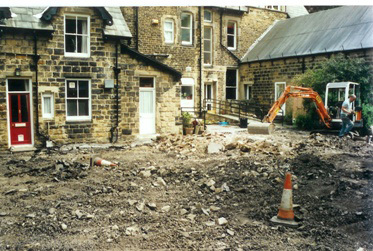 Upon closure in 1998 we were successful in acquiring the somewhat forlorn buildings, saving them from likely conversion. 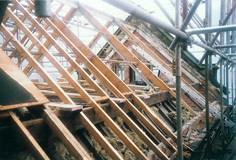 We were determined to both re-instate the original name and to undertake a much needed restoration throughout. Westwood Lodge had become a Grade II Listed Building of Historic Importance, but many of the Listed features had been hidden under concrete and carpets. We set about giving the house and cottages the face-lift they deserved. Our aim was to bring back the original features and ambience, whilst providing high standard facilities and accommodation with modern amenities. 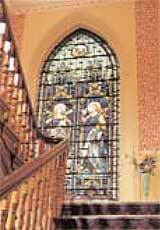 For example, halfway up the main staircase is the magnificent stained glass window featuring Faith and Hope (left). Fireplaces were opened up and for the first time in years, roaring log fires have warmed the main lounge and Orchard Cottage, bringing back the cheer of a bygone era. Interestingly, the chimney sweep who opened them up, was the same man that had the job of bricking them up thirty years before! Since the first phase of the restoration, we have gone on to restore the cottages as well as create the top floor apartments and The Old Gallery (the roof of which is pictured on the right). However, we recognise that there is always going to be plenty to keep us busy! Westwood is now very much our home and we want to share this splendid place with those who appreciate solid walls and hand crafted architectural features giving a presence that so many modern buildings lack.